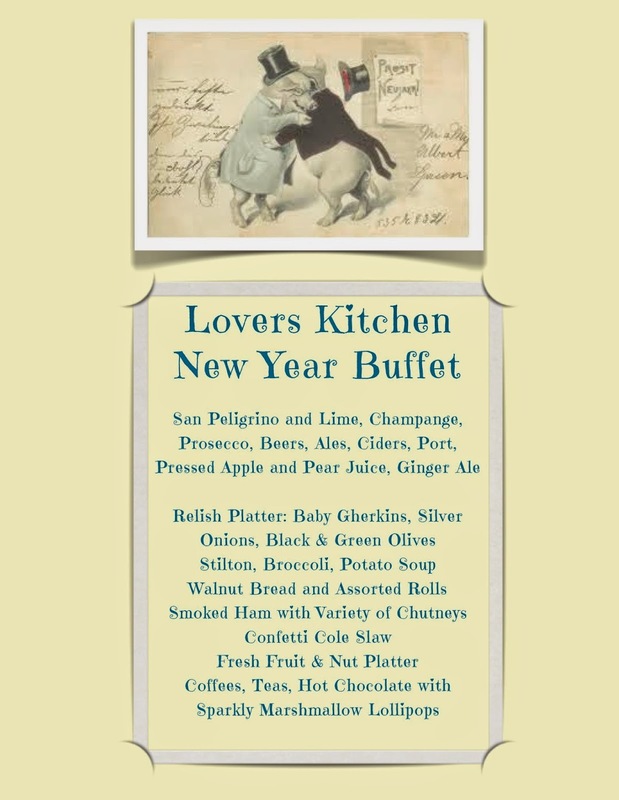 A week after Christmas, a potluck style buffet is ideal for welcoming in the new year. Stilton, Broccoli, Potato Soup, topped with a bit of Tomato Chutney, will appeal to vegetarians. A luxurious Honey Smoked Ham, stirs the passion of most carnivores. Bearfield's of London does a superb Honey Smoked Ham on the bone, 6.5kg for £50, delivered via Costco UK. It's a good idea to check with your guests for dietary restrictions. Much as I love pork, many people don't eat it. 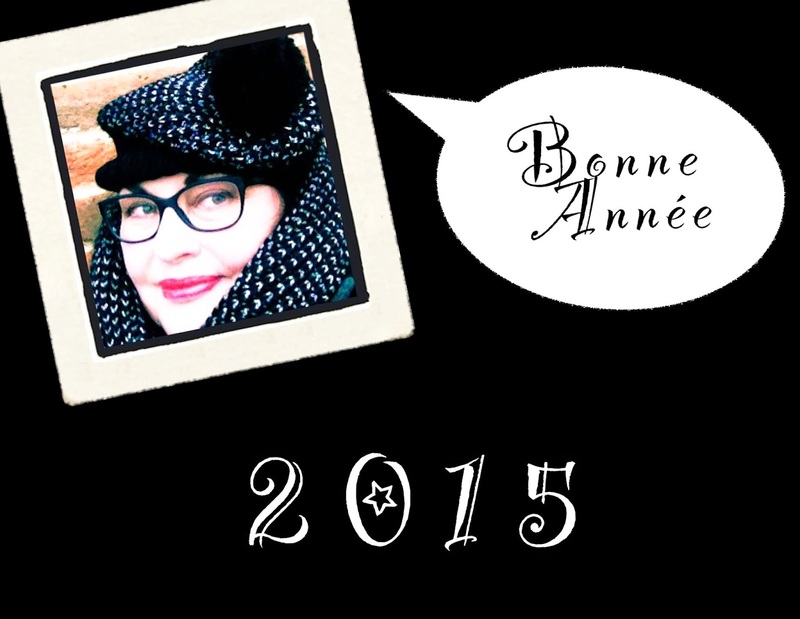 Confetti Coleslaw is perfect for a New Year Buffet. It works beautifully with ham, as well as chicken and turkey. A food processor with a grating blade will make this salad a breeze. If not, you'll need a sharp knife and a coarse grater. Wash all the produce. Set aside. Shred the cabbage finely using sharp knife, or food processor. Place cabbage in super large colander (or two regular colanders) Throughly toss with salt and allow to drain in sink for a couple of hours. Cabbage has a lot of water in it. You want to remove much of it so the salad will retain the integrity of the dressing. While cabbage is draining, shred salad onions, carrots, parsnips, and miniature fennel. Place in very large bowl, preferably a clear bowl to show off the salad. Now for the dressing: In medium size bowl, peel and grate ginger. Finely chop Jalapeno peppers. If using fresh Jalapeno, de-seed first. Add Walnut Oil, Rice Wine Vinegar, Honey, Soy Sauce, and Peanut Butter. Mix well. Set aside. After a couple hours of draining, rinse the cabbage thoroughly. Gently press the cabbage with a clean towel, pushing out as much water as possible. Place another clean towel on the counter top. Pour out the cabbage and gently dry. If you have a salad spinner, this might be the ideal time to use it. When cabbage is dry, add it to the other shredded vegetables, tossing and mixing well. If serving the same day, add the dressing, coating produce with zippy goodness. If serving the next day, refrigerate the salad, covered in plastic wrap. Dress salad at least an hour before serving. Serve cold or at room temperature. Garnish with parsley leaves and sesame seeds. Especially good with sliced honey smoked ham, stuffed in an Italian style bread roll, with plenty of coleslaw. If you've vegetarians on your guest list, consider having a bowl of crushed peanuts or cashews on the side to accompany this salad. It works well and will add protein. I love listening to music while cooking. This is especially true before a dinner party. On Christmas morning I heard the song "Walking in the Air," for the first on Classic FM. This is often how I discover new music. Classic FM should get a commission on the songs I buy from iTunes. This particular version of "Walking in the Air" was recorded by Welsh singer Aled Jones. I instantly fell in love with it and purchased it for my "Karl Jenkins and Friends" playlist. "Walking in the Air" was written by Howard Blake for the animated short film "The Snowman." Apparently it was taken from his "Lullaby - A Christmas Narrative." I knew none of this until listening to the song. Making soundtracks for our dinner parties was one of Richard's many talents. When I make them I often end up buying something like "The 50 Most Essential Pieces of Classical Music" in the interest of time. Too late I discover I like about ten recordings out of fifty. This said, there is actually such a collection on iTunes for £5.99. Absolute bargain. 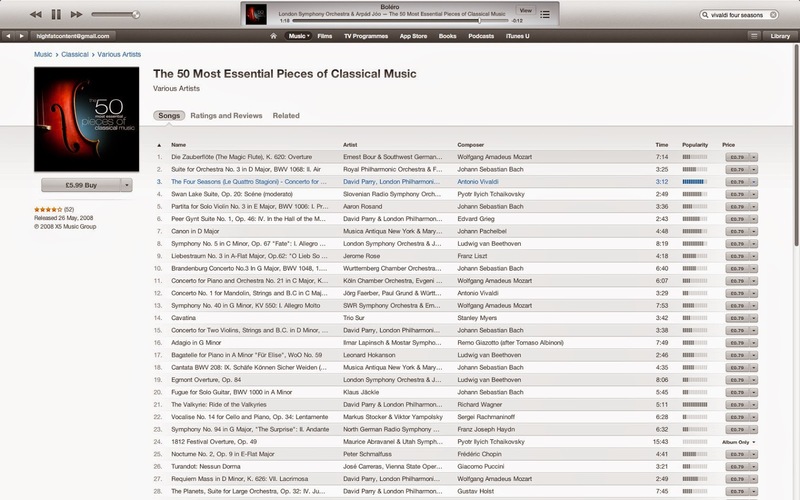 "The 50 Most Essential Pieces of Classical Music" reminds me of how much I love Vivaldi's Four Seasons; Pachelbel's Canon in D Major; Beethoven's Brandenburg Concerto No.3 in A-Flat Major; Vivaldi's Concerto No. 1 for Mandolin; Bach's Concerto for Two Violins; Mozart's Requiem Mass in D Minor, and a host of other classics. This was actually a brilliant purchase and perfect for New Year's Eve. Highly recommended. A big one for making New Year resolutions I rarely keep, this year I will organize my music into soundtracks that equally enhance meals and moods. If you had to choose a single song to define you, what song would it be? I think I'd have to choose Karl Jenkins's "Adiemus," by the London Philharmonic Orchestra and Miriam Stockley. There is something about this song that stirs my soul. Though now my mind is wandering to "Zorba's Dance" and smiling. We all have a bit of Zorba in us. I'm seeing a Greek themed dinner party come spring.